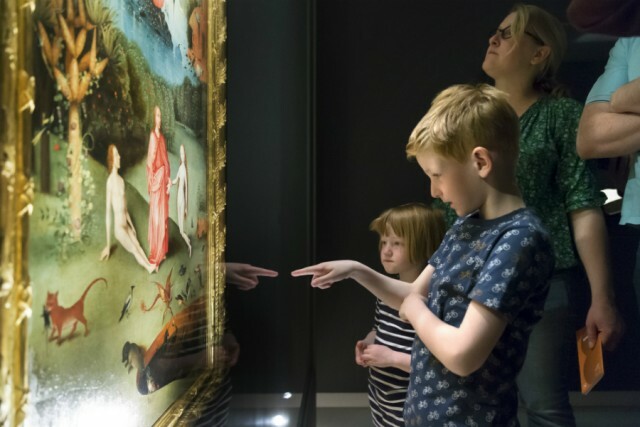 Earlier this year in ‘s-Hertogenbosch (aka Den Bosch) – the town that gave Hieronymous Bosch his name — Het Noordbrabants Museum held a major exhibition of almost all of his work. In one building, 17 of the Dutch master’s 24 paintings were shown alongside 19 of his 20 extant drawings. In her contribution to The Curious World of Hieronymous Bosch — a feature-length film produced by the UK production company Exhibition On Screen, which details the contents and making of this exhibition — art historian Jennifer Sliwka is one of many experts to emphasise the unprecedented value of this show. Visitors to Noordbrabants Museum’s Jheronimus Bosch — Visions of Genius will have noticed its specific spatial care: altarpieces whose panels had been scattered to the winds were brought into proximity; series were reunited; themes and motifs could be traced from one canvas to the next (I visited in February, and was fascinated by the profusion of owls from painting to painting). The film, which is directed, produced, written and shot by David Bickerstaff and Phil Grabsky, is not an entirely satisfying surrogate for this exercise in re-integration, but it does partially succeed in reflecting the value and intrigue of Bosch’s artwork. As The Curious World of Hieronymous Bosch makes clear, the exhibition was a curatorial coup in a number of respects. Despite its location mere minutes away from Bosch’s old house on the town’s main square, Noordbrabants Museum did not own any of the works on display in Jheronimus Bosch – Visions of Genius. The institution’s main currency in securing the loans it needed from museums and collectors around the world was a relatively abstract one: knowledge, under the umbrella of the Bosch Research and Conservation Project (BRCP). Using technologies like X-radiography and infrared reflectography, the staff behind BRCP spent roughly six years working on Bosch’s paintings in order to gain a better understanding of their production history and to better preserve them for future generations. For Bickerstaff and Grabsky, the most relevant aspect of BRCP is a by-product which lends itself well to a cinema setting: the research created a number of extremely high-resolution digital scans of Bosch’s work, and these constitute the bulk of the visual material in this film. 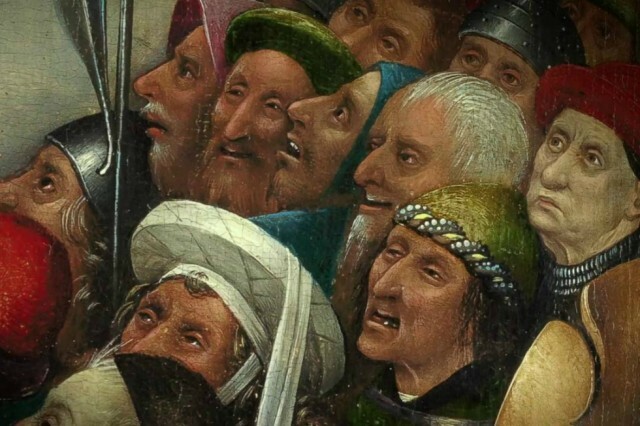 In fact, the first two and a half minutes of The Curious World of Hieronymous Bosch consist of close-ups of various Bosch canvases, set to sweeping music. In the first episode of his 1972 BBC series Ways of Seeing, John Berger attunes us to the distortions that camera movement and incidental music can bring about on our appreciation of artworks. As an example, he sets Caravaggio’s Supper at Emmaus to excerpts of “sprightly Italian opera” and “sombre choral music” respectively, and the effect is clear: through the latter lens the work appears more sacred, through the former more profane. To its credit – and this is a backhanded compliment if ever there was one – The Curious World of Hieronymous Bosch doesn’t ever really appear to know once and for all what to make of Bosch’s work, or to advance one line of interpretation above all others. It is part-exhibition audio-guide made visual, part-middlebrow television arts documentary, part-experimental exercise in translating painted surfaces to the silver screen — and somewhat inconsistent for all that. Of the various talking heads recruited to interpret Bosch’s work, it is Times critic Rachel Campbell-Johnston who offers the most frustrating contribution. For Campbell-Johnston, “Bosch’s really important role in art history is the way he links the past and the present.” This view is more or less in keeping with the painter’s reputation as a surrealist working four centuries before the birth of Salvador Dalí, but focusing on Bosch’s apparent modernity avant la lettre can come at the expense of a really compelling picture of the artist as a medieval subject. When Campbell-Johnston claims that “Bosch was taking this very fairytale world as we see it, but factual world as medieval people saw it… this is what they believed”, it feels like we are being fed lines from the most stereotypical account of the Middle Ages. Furthermore, it doesn’t really tell us anything that isn’t already clear: with his gross-out humour and ghoulish creatures, Bosch is evidently one of the most palatable and commodifiable of medieval painters for modern audiences, a fact which was reinforced by the sheer scope of Bosch-themed items on sale in Noordbrabants Museum’s gift shop. In addition, outside the museum on a street lined by cafe terraces, a detail from Bosch’s Garden of Earthly Delights triptych (1503-15) — featuring an upside-down naked man half-sunk into the earth, with a large red fruit and two colourful birds perching in the “Y” formed by his splayed legs — had been turned into a zany work of public sculpture, like a more lysergic Superlambanana (the original canvas from which this scene is lifted is, interestingly, one of the seven that didn’t make it into the show). More worthwhile contributions come from the aforementioned Sliwka and fellow art historian Lelia Packer. Their voices are higher in the mix at those moments of the film where it studies the paintings most intently. Focusing on Bosch’s St. John the Baptist in the Wilderness (1499), Sliwka draws attention to tiny details, like the bear devouring its prey in the distant background. In a discussion of the Saint Wilgefortis Triptych (1495-1505), we are told the story of the bearded female saint represented in the central panel, and given time to contemplate the shipwreck and burning town depicted on the wings. Bosch is rightly admired for his idiosyncratic flights of fancy, but it’s more marginal or historically-specific details like these that sometimes seem the most rich in meaning: turn up for the naked man fondling a giant owl, or the pig in a nun’s habit; but stay for the woman receiving hack dentistry in the foreground of The Haywain (1510-16), or the tiny representation of a man riding a unicorn in the “Heaven” section of the Last Judgement altarpiece (1495-1505). Sliwka notes: “When I think of Bosch, and when I talk to other people that have looked at Bosch paintings but are not art historians, what they always remember are the small anecdotal details; the curious, often unexplainable details…What’s fascinating about Bosch is he’s remembered in all the intimate details except for the main subject of many of his paintings”. Appreciating Bosch is a time-intensive procedure, in other words, and The Curious World of Hieronymous Bosch is at its best when it slows down and stops rushing to conclusions.